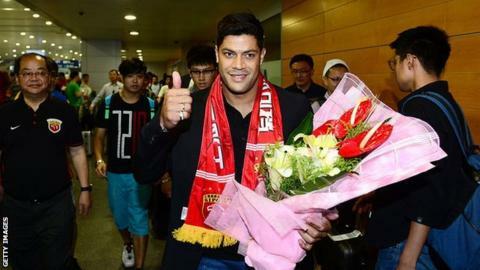 Brazil forward Hulk has become the most expensive signing in Asian football with a £46.1m (55.8m euros) move to Chinese Super League side Shanghai SIPG from Zenit St Petersburg. Shanghai, managed by former England boss Sven-Goran Eriksson, broke the record of £38.4m that Jiangsu Suning paid for compatriot Alex Teixeira. Hulk, 29, scored 21 goals for Russian side Zenit last season. Chinese clubs spent almost £200m in the most recent transfer window. Hulk, who played for three Japanese clubs before moving to Porto in 2008, signed for Zenit for £32m in 2012. He joins former Sunderland striker Asamoah Gyan at Shanghai. Runners-up in the CSL last season, Shanghai are currently fourth in the table. The Chinese Football Association announced plans in March to become a "world football superpower" by 2050. The national team - 81st in the Fifa rankings- have qualified for the World Cup only once, in 2002. Eriksson, who coached Guangzhou R&F before joining Shanghai in 2013, has said the league's growth will attract "even bigger names". Football in China: Will China become a 'world football superpower'? Pick, drop & avoid - who is in your England World Cup team? Read more on Pick, drop & avoid - who is in your England World Cup team? Is England manager the best or worst job in sport? Read more on Is England manager the best or worst job in sport?